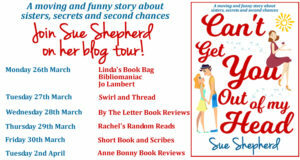 I’m so pleased to be taking part in the blog tour today for Can’t Get You Out of My Head by Sue Shepherd. Thank you to Jane at Corazon Books for asking me to be a part of it. Sue has written a fab guest post entitled “Grandma We Love You” along with a little taster from the book but first, let’s see what it’s all about. Another entertaining page-turner from the No.1 bestselling author of Doesn’t Everyone Have a Secret? – where things, and people, are not always as they first appear! Like the sound of it? Then here’s the buy link you need. I’m so excited to be celebrating the publication of my third novel. Can I tell you a bit about it? 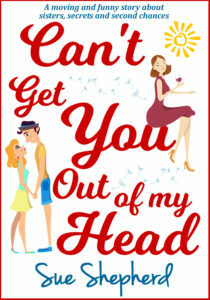 Can’t Get You Out of My Head is the story of twin sisters, Beth & Lisa. As you can imagine, they’re very close. Throughout their childhood they share everything. But that kind of intimacy cannot be sustained. As they become adults, Lisa has had enough of sharing, and wants to branch out and have some fun. Frightened of the consequences, Beth really needs to stop her, but, due to a decision she made many years ago, she remains riddled with guilt. Can she find the strength to call the shots? There are, of course, many other characters in the novel. There’s the twins’ parents, Don and Pat, a seductive young Italian man, a smooth-talking backpacker and some heartwarming friendships. However, the character that I’d like to talk to you about today is – Nanna. This is how the girls’ nanna is introduced in the book – even though she was only one person, Nanna managed to be better than everyone else’s grandparents put together. On the outside, she appeared for all the world like an ordinary, sensible woman who was approaching old age, but she was, in fact, utterly fantastic. She would think nothing of joining in when the neighbourhood kids played run-outs on the green, she threw herself into games like your average six-year-old, always prepared to embrace whatever imaginary scenario the girls had thought up. Plus, she carried a never-ending supply of goodies in her handbag. In short, she just had a way of making everything a little more fun. But make no mistake, she could be strict if need be. Growing up in poverty and losing her husband way too soon into her marriage, had given her a tough exterior, and you messed with her at your peril. I really enjoyed exploring the relationship between Beth & Lisa and their grandmother. In the past, I’ve written quite a lot about the connection between parents and their grown-up children. Such as; Mike and his mother, Florence, in my first novel, ‘Doesn’t Everyone Have a Secret?’ and Jessica and her dad, Ed, in my second, ‘Love Them and Leave Them.’ So, as I approached book three, it occurred to me that it would make a nice change to focus on a slightly different relationship – that of a grandparent and a grandchild. I didn’t have to look far for ideas. I must confess that my own mother-in-law was very much the inspiration behind the character of Nanna. A lady of a certain age doesn’t have to be a quiet background figure, who merely sits in an old armchair and knits. Oh, no. I knew instantly that Nanna was going to be a feisty character. Being from London, my mother-in-law is quite forthright and very funny, and I got many of Nanna’s expressions from her. Like Nanna, she used to think nothing of running around with her grandchildren. When our sons were little lads, my in-laws would come over after school, and my mother-in-law could often be found in the garden, playing football with the boys. They even used to make her go in goal! She’s into her 90s now, and, although she no longer plays in goal, she’s still as sharp as a tack. She gets the Countdown conundrum way before I do! I wanted to write about a grandma who was fiercely proud of her grandchildren and hugely supportive at all times, and I’m happy to say that Nanna fits the bill. I think she manages to be the matriarch of the family, whilst still showing her caring side. I hope you’ll think so too. Thank you, Sue. Nanna sounds like quite a lady! ‘Nonsense. This is a brilliant beard,’ Charlie snorted. ‘Is that little Charlie Morris?’ Pat had a closer look. ‘You’re not wrong. How are you?’ She was staring up at him, amazed at his size. ‘We’re going to pop out for a drink to catch up. Don’t worry about me for dinner, Mum, I’ll get something whilst we’re out.’ Beth grabbed her handbag and made her way over to the hall mirror. Applying an extra coat of mascara and some fresh lipstick, she then set about adding some cover up to the scars on her chin, a constant reminder not to listen to Lisa’s advice. ‘OK. Just the two of you, is it?’ Pat asked. ‘He had no intention of catching up with her, you idiot. Can’t you tell when someone wants to be alone with you?’ Lisa asked. Born in Harrow, Sue went on to spend several years living in Hertfordshire before selling up and taking a leap of faith across The Solent. She now resides on the picturesque Isle of Wight with her husband, two sons and a standard poodle. Her passions in life are: her family, writing, the seaside and all the beautiful purple things her sons have bought her over the years. 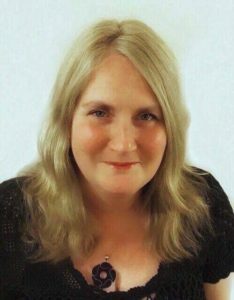 Happiest when hunched over her laptop with a cup of tea on the go, Sue loves to create stories with plenty of heart and laughs, but she makes sure to include a bit of naughtiness too. Ask Sue to plan too far in advance and you’ll give her the heebie-jeebies and she’d prefer you not to mention Christmas until at least November! It was my pleasure, Sue.